For those who have read my initial Livewire #1 review, I note that I am excited for the future related to the title character and her flawed version heroism. However, Livewire #2 suffers from a common flaw in many a narrative sequel, and that is one of pacing. For the uninitiated, Amanda “Livewire” McKee is a powered individual that is on the run for causing a disaster with her technopathic powers. Issue #1 shows us the immense power that she possesses, only to contrast this with the emotional damage her past has caused amongst public and personal relationships. It is this dynamic backdrop that excited me heading into the next issue, but the doldrums of plot development really bog down the character this time around. Livewire #2. Image credit Valiant Entertainment. Without drifting too much into spoiler territory, our protagonist finds herself at the mercy of some rough and tough mercenaries. The villainous dialogue drifts to almost comical territory with the over explanation of all the “bad things” the mercenaries are doing to Livewire to make her crack under the pressure, even going to far as to explain exactly how a particular device works to her. There is also a “bro-soldier-guy” that torments Amanda with physical abuse, as seen above. 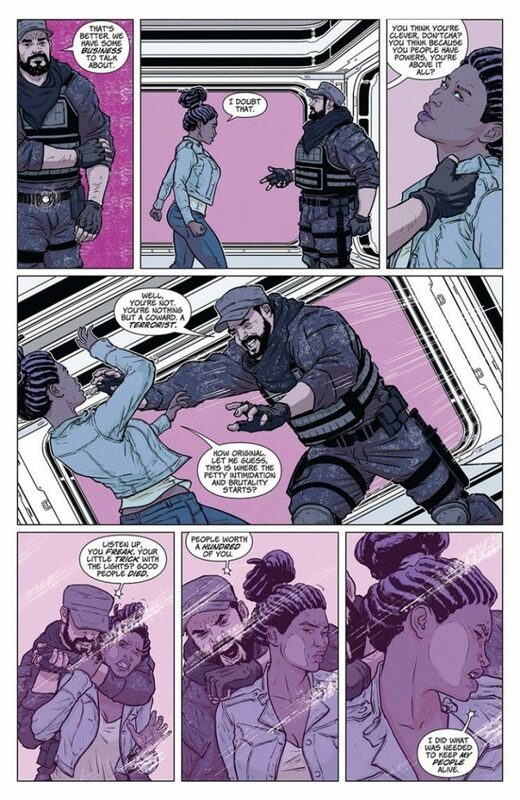 Although Livewire eventually uses this to her advantage later in the story, the elongated scenes of a white male beating on a woman of color at the very least border on trope territory, and this sequence could largely have been removed and still driven home the same points that were trying to be communicated narratively. Overall, I was disappointed in Livewire’s second offering. The complex backstory, ambiguous motivations, and cool superpowers that I said motivated me for this comic were largely if not completely absent this time around. However, there was enough intrigue here to warrant continued reading (who is that mysterious guy in the opening pages?) and Livewire is such an engaging character on her own it feels as if the story will eventually right itself. This was a rough second outing, but I would still recommend Livewire to those looking for a new series to take on.